Yes We Can. . .
. . .grow vegetables in less than 8 hours of sun per day. This isn't the first time I've had a veggie bed in less than full sun. It might not be quite as productive as veggies grown in 6-8 hours or more of direct sun.
. . . No baby squash yet, but the vines are growing and blooming beautifully. The peas are still growing, blooming, and producing in spite of the heat. With the arrival of 90-degree temps, some vines are beginning to dry out. I remove them, leaving those that are still producing. Peas are interplanted with squash, pole beans, and cucumbers on the trellis in my small garden. Garlic scapes have been removed. (Aren't they cute?) I've never grown garlic before, and learned about removing the scapes from Gina. They are delicious! Last week I sauteed some with fresh asparagus. Yum! My small veggie bed gets about five hours of late morning through afternoon sun, and everything is growing and producing well. I'm growing lots of lettuces and other greens, peas, several varieties of tomatoes and peppers, garlic, beets, pole and bush beans, and squash. On the other side of the house, which gets only morning sun, I threw in a few extra peppers, and they're producing as well. My first veggie garden was already growing when I moved into my first house over 30 years ago. It too was in part sun, morning sun at that, and was very productive. The following year I dug a new veggie plot on the southwest side of that house. It got afternoon sun, about five hours, same as here. I had no complaints about the productiveness of that garden. So late last summer and early fall as I was looking for a place to grow veggies, I was confident our semi-sunny side yard would be perfect. Supposedly tomatoes grown in less than eight hours of direct sun per day aren't as tasty as those grown in the prescribed amount of sun. I've never had any complaints about my tomatoes - they've always been productive and delicious. So for those who long to grow a few veggies but who, like me, don't have anywhere in their yard that gets the recommended 6-8 hours or more of direct sun, don't be afraid to experiment. Please know that even in zone 5, 4-5 hours of afternoon sun, or even late morning and early afternoon sun is enough to grow a respectable, productive vegetable garden. Last Saturday I joined local Master Gardeners for a tour of Possibility Place, a native plants nursery in Chicago's south suburbs. We met at the Extension office. Our morning began with a bit of excitement, when Sue, (our Master Gardener Coordinator) spotted a large turtle preparing to lay her eggs right at the curb in a front garden near the office's parking lot. Not the safest place for mother or babies, one of the braver among us scooped her up as she hissed and complained, and moved her across the street, back to where she probably came from. Then we were off for our short ride to the nursery. As we pulled into the driveway, the first thing we saw was this wonderful old barn. Possibility Place is so much more than a nursery. Wisteria was blooming on the lovely arbor entrance. I had to get a closer look at the weather vane on top of the arbor. We did some preliminary exploring as we waited for our tour. We had to laugh when we came across this garden ornament. Peeking through the woods, this friendly scene caught my eye. Just as the clouds opened, we were greeted by Connor Shaw, the nursery's owner and our tour guide. Due to the rain, Connor decided to start our tour in one of the greenhouses. We learned a lot about the rewards, methods, and challenges of growing and selling native trees, shrubs, and perennials. Here, he's showing us one of his very special plug trays. Possibility Place uses a very different, (and expensive) container system for growing these plants. The holes in the sides and bottoms of the containers encourage roots to branch, instead of growing around the sides and bottoms. Once a root tip hits the air, it stops growing. Using this method, known as air-root-pruning, stimulates root branching and produces a substantial, non-circling fibrous root system. This results in greater root tip surface area, allowing better absorption of water and nutrients, better growth, establishment, and vigor, and ultimately better plant health at the nursery, and later, in our gardens. Earlier this spring I was impressed with how well the plants I purchased from a couple of native plant sales had already established and grown in my garden. The organizations hosting the sales had gotten their plants from Possibility Place. Learning about Connor's superior growing methods, I understood why the native plants I purchased were doing so well. one lovely view after another. Just about the time Connor was wrapping up his presentation inside the greenhouse, the rain stopped. We were able to go back outside to check out more of the beautiful grounds, with Connor as our expert guide. one of several beautiful gardens on the nursery's grounds. Our discussion continued, with Connor talking about the native trees, shrubs, grasses, sedges, rushes, and forbs he grows on the grounds, his philosophies, and his extensive knowledge and experience. white baptisia - isn't it gorgeous? He discussed his design philosophy, identified many plants and discussed their cultural requirements, and talked about how he grows his gardens, 'stacking and packing' the plants. Stacking is planting by height, with trees, shrubs, and larger plants in the backs of the borders, shorter plants towards the front. swamp rose - wonderfully fragrant. Not only was I happy to hear that he plants this way, I felt the results spoke for themselves. The gardens are naturalistic and beautiful. Nothing looked overcrowded, and everything looked healthy and happy. native honeysuckle - much more interesting and beautiful than the imported, invasive honeysuckle. yet another lovely view. A few annuals add color. I jumped at the opportunity to attend this field trip. It was only last year that I first heard of Possibility Place, as I was looking for a local supplier of native plants. I did already have some natives in the garden, and wanted to add more. Last year I became aware of a couple of local, annual native plant sales. I wasn't able to check them out due to conflicts in my work schedule, but learned that the plants were locally-grown at Possibility Place, this hidden south-suburban gem. Primarily a wholesale grower, Possibility Place also sells to the general public. Choose plants through the catalog, call to place your order, and make an appointment to pick up your plants - it's that easy! Your plants will be set aside and ready for payment and pickup. They don't ship, but for us locals that's ok, because you'll really want to get a peak at this gorgeous, inspiring place. Thank you so much Connor, for sharing your passion for native plants, for being so generous with your time and knowledge, and for letting us pick your brain! It was a pleasure and privilege meeting you, and a great learning experience. I think it's safe to say we all left with lots of information, ideas and inspiration, and an increased appreciation for native plants and the challenges and rewards you experience growing them for us. click on collages if you'd like to enlarge them. Better late than never, here's some of what's blooming here this month, starting at the top, left to right - Penstemon digitalis 'Husker Red,' and a new salvia - 'Blue Hill,' planted near the veggie garden to (hopefully) attract more pollinators there, and lamium, which will bloom off and on all summer. 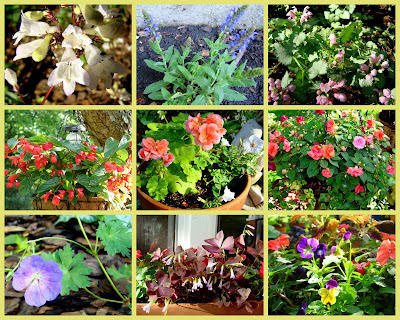 2nd row: a dragon wing begonia, an experimental Pelargonium with Spring Fling Supertunia courtesy of Proven Winners (the experiment is a geranium/Pelargonium in very little sun - less than 3 hours a day of filtered sunlight, budding and blooming very nicely,) and double impatiens in a hanging basket. 3rd row: Geranium 'Rozanne,' Oxalis triangularis, which has seen three summers, overwintered indoors the last two years, and a pansy still looking good in our (so far) cool spring. Again starting from the top left, this is the last, and always the sturdiest Digitalis grandiflora of three. They were among the first perennials I planted here 6 springs ago. I'll be saving seeds later this summer in case it doesn't come back next year. Next are Campanula carpatica, a pretty little thing with a long bloom period, a squash blossom, and Geranium sanguineum var. striatum. 2nd row: yes, that's a mum blooming in June. Billed as a 'spring blooming mum,' and very cheap at the big box store, I got two of them, this one and an orange. Spring-planted mums are more likely to survive winter. In my last house I had a bunch of mums planted in the spring that came back year after year. I'll probably take some cuttings of these two - mums are very easy to start from cuttings. After the mum, a pea blossom, Aquilegia 'Cardinal,' (a/k/a columbine,) and a mini-rose that's been blooming in part sun for six years, along with a red one. 3rd row: another Geranium sanguineum, this one is a/k/a bloody cranesbill - one of the few plants brought here from a previous garden, it's been very slow establishing, but has hung on for six years. This is the first year it's been of any size at all, blooming for about a month, and I accidentally broke off most of it pulling maple helicopters out of the mulch. Next is Nepeta x faassenii 'Blue Wonder,' a shorter catmint. I've grown this one for years in previous gardens. It may be heresy to some, but I like it much better than Walkers Low or other tall catmints. Next is a pepper blossom. Don't ask me what kind, as none of the peppers (or tomatoes) were labeled. Did I ever mention I like surprises? The last photo is Juneberries (a/k/a serviceberry,) an Amelanchier, an unknown cultivar, maybe canadensis, that's been here for many years. I know, they're not blooms, but they're pretty and fleeting - thought I'd get a shot of them before the birds gobble them up. June berries are very tasty - sort of a cross between a cherry and a blueberry. They're more seed than berry, and we leave them for the birds who will be spending a lot of time in this beautiful shrub as the berries ripen over the next couple of weeks. As if serviceberries weren't beautiful enough to recommend themselves on their own, the varieties of birds they bring into the garden in June makes them must-have shrubs for me. This is finally the year this shady garden is beginning to come into its own. I'm sure the copious rain this spring hasn't hurt. But after six years, although it will never be 'done,' the garden is full of plants. There are no big empty spots anymore. Older plants are establishing well, and newer plants are thriving. 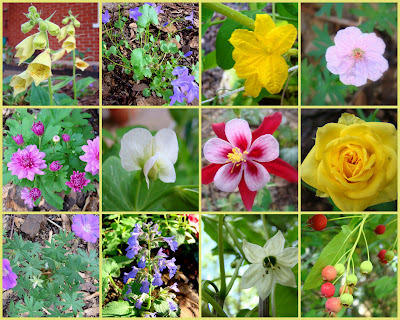 There were a lot of natives added this spring, but then, that's a whole other post(s) for another time. Here's one full-size photo. This is Geranium x cantabrigiense 'Biokovo,' planted in spite of dire warnings of its invasiveness. Spreading by above-ground rhizomes, I find it's very easy to keep in check. I love it's evergreen foliage, (often red over the winter and in early spring,) it's long bloom period, and the wonderful, spicy fragrance of the foliage. Thanks to Carol of May Dreams Gardens, who I got to meet at Spring Fling (and she's a sweetheart,) for hosting Garden Blogger's Bloom Day on the 15th of each month. The garden has been calling me. The pots and baskets have been out for a couple of weeks, and are starting to fill in. This year we're going with bright colors. Last year there were more pastels. There are less ornamental pots this season. Two angel's trumpets and most of the overwintered geraniums were given to Mom and my sister. Other pots are being used for vegetables. The yellow mini-rose is blooming. It was a gift from the Lawn Man when we were dating. The red one has buds. The cool spring has been good for peas. Planted in March, they had a slow start. They've been producing like crazy for about three weeks. The bush beans have their first set of true leaves. Pole beans received at Ginkgo Organic Gardens in support of One Seed Chicago started coming up today. The squash and cucumbers were started in the basement. We have baby cucumbers already. Through the cucumber vine there are tomatoes, lettuce, and garlic. I'm already amazed how productive a small vegetable bed can be. Squash vines are blossoming. I remember from previous vegetable gardens the long wait for the first baby squash. Planting them early in the basement may give us a jump on the waiting game. The squash and cucumbers are mingling with the peas. Before long it will be time to take the peas out, as this cool weather won't last forever. I wonder if any peas will ever make it to the kitchen. In spite of my relative absence the gardens are thriving. I'm gradually catching up with everything that was neglected while all my energy was focused on clients and Spring Fling. It's good to be back to the garden I love most. I've had so little time for blog visits and responding to comments. It's time to reconnect here at home to the things that matter most. While some SF participants prepared to leave and others opted for time on their own, the small group who joined us Sunday morning at Garfield Park Conservatory were wowed by our visit to one of the oldest, largest, most beautiful conservatories in the US. Designed by Danish-American landscape architect Jens Jensen in collaboration with a group of Prairie School architects and a New York engineering firm, the Conservatory celebrated its centennial last year. This shot is from a visit during the year-long centennial celebration. On the National Register of Historic Places, the Conservatory and it's outdoor gardens are crown jewels of the Chicago Park District. I'd be twice this height in stature. Where I'm biggest in my class. Ferns are among the oldest, coolest plants on Earth. The oldest plants in the peaceful Fern Room surpass three hundred years. Winding paths delight the senses. The shades and textures of green are a visual, tactile joy. Beautiful, naturalistic displays made it easy to forget we were in the heart of the big city. The outdoor gardens are lovely too. City Garden is a model for urban greening. Don't be fooled (I was for a moment,) the birds perched on the martin house aren't real, they're sculpture. Tough, city-hardy plants and recycled urban materials are artfully combined. Tumbled blue glass elevates a simple gravel path. Can you tell I loved this garden? Last year I visited the Conservatory in March when the outdoor gardens were still sleeping. After seeing them it's safe to say I'd go back for the outdoor gardens alone. The visit to Garfield Park Conservatory Sunday morning with our warm, friendly group was a wonderfully memorable end to months of hard work, blood, sweat, sometimes controversy, and even a few tears. I'm incredibly proud of our organizing committee and our commitment to the success of Spring Fling through all the challenges we faced. The warm, heartfelt expressions of gratitude we received throughout the event made it all worthwhile. Garden Bloggers Spring Fling, conceived in Austin, Texas in 2008, came to Chicago in 2009, with plans already underway for a third year in Buffalo, New York. Our best wishes go out to the organizers of 2010's Garden Bloggers Spring Fling for another successful, memorable event. Spring Fling Saturday - A Busy Day!